TRUEALCHEMYCOLLECTION.v1 from Alex Zelenty on Vimeo. The True Alchemy Collection is a story of 12 beauties, archetypes, muses and mystics. The collection is a pure collaboration of ideas and musings of the theme Alchemy & Ardor: a moving, living, breathing art experience. The combined experience of 6 California Artists created collaborative runway show with a powerhouse team of talent, skills, and interdisciplinary art and design histories. Visionary painter Amanda Sage and textile and clothing artist Shabnam Q. collaboratively printed a range of gorgeous fabrics of Amanda's paintings with a facility in DTLA. These fabrics have all been transformed into wearable art clothing pieces by Scatha G. Allison, Domini Anne and Shabnam Q. 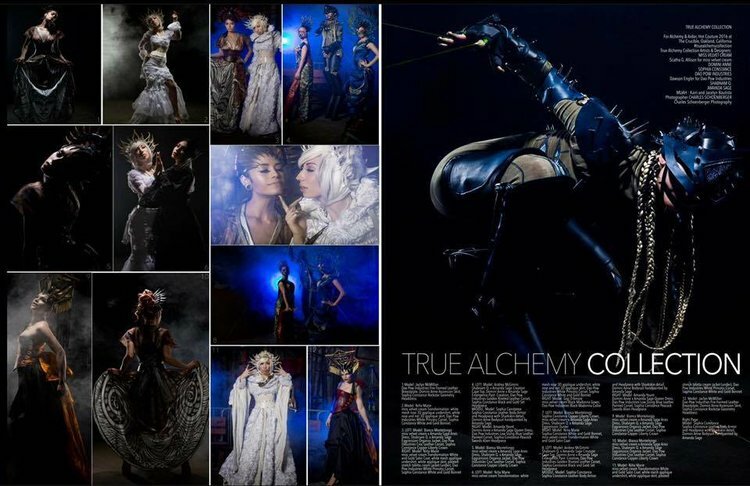 Each outfit is highlighted by leather and metal body couture created by Dawson Engler for Dao Pow Industries, Sophia Constance, the returning Hot Couture artist and performer has created a story of headpieces, masks and a fantastical creature from the depths of Imagination. All pieces have been designed and constructed by the artists in their studios, working only from a collective mood board, language and poetry. The True Alchemy Collection is a pure expression of art and collaboration, capturing a moment that can only be experienced live as all the elements come together at Hot Couture. See each of the artist's work and more information about their process on their websites and social media presence. The True Alchemy Collection is a collaborative project between 6 artists and designers based in 5 different California cities. The 12 look collection combines fabrics and hand painting from artist Amanda Sage with designers Scatha G. Allison, Domini Anne and Shabnam Q. creating one of a kind, neo-couture wearable art pieces. Dawson Engler brings luxury leathers and metal body adornments matched to each of the outfits, and performance artist and leatherworker Sophia Constance completes each character with handworked leather headpieces. The designs of the collection are a reflection of the process of Alchemy, starting with a dark, moody and warrior-like series of looks. In the midst of this story appears a Creature of the Imagination performed by Sophia Constance. She brings the essence of transformation and all the looks following shine with a golden lightness, radiating, transformed into Gold. The collection as a story, is in itself an alchemical moment. Looks are combinations of textile prints and paintings, as well as luxury fabrics, and pieces by each of the designers are combined together to create outfits that are both commanding and visionary in their presence. The feeling is one of a mystical combination of cultures and ancient stories, and at the same time sharply modern, with strong, elegant lines; exquisite craftsmanship, and beautiful, wearable clothing.